On one side a sweeping golden beach is the playground of windsurfers, on the other is the old town, the Medina; a UNESCO World Heritage Site whose narrow old streets are full of mosques, markets and music. Essaouira in Morocco is a curious place; part working port, part holiday resort and part historical monument with a fusion of colonial European, Arabic and African influences that makes it feel like somewhat of a crossroads between different worlds…which in many ways is exactly what it was. 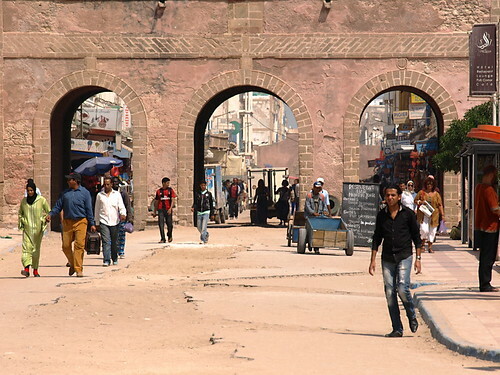 Formerly known as Mogadir, Essaouria has been a port since the time of the Phoenicians and was one of the major trading centres linking Africa with Europe in the 17th and 18th centuries when it was also known as the Port of Timbuktu. 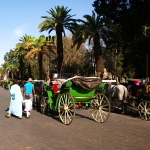 The current Medina dates back to around the mid 18th century and was built after Sultan Sidi Mohamed ben Abdellah employed the help of a French architect who specialised in military fortifications. The result was a town that had an Arabic heart inside fortified European walls. Its role as an important trading port meant that it was a melting pot for different cultures from across Africa and Europe attracting artists and musicians as well as traders. This has influenced its current personality to reflect a nature that is part working town, part bohemian haven. Many shops exhibit paintings that have a style peculiar to Essaouira – vibrant and psychedelic colour schemes with images that are simplistic but hypnotic. The music heard from within shops in the Medina is the equally individualistic Gnaoua (or Gnawa) which has evolved from north African roots into a mix of African, jazz, reggae and blues. 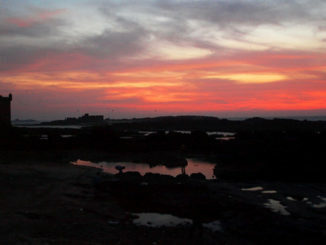 It is this recurring theme of a mix of influences that helps makes Essaouira a fascinating and surprising place to visit; it simply defies categorisation. Much more chilled than the Medina in Marrakech, visitors exploring the Medina in Essaouira get ignored most of the time and its grid layout means that it’s easier to navigate. Spices, olives and the fish market add colour and aromas to the old town whose character changes at different times of the day as shops are replaced by bars after darkness falls. Good buys are some of Essaouira’s colourful art and a Gnaoua music CD. 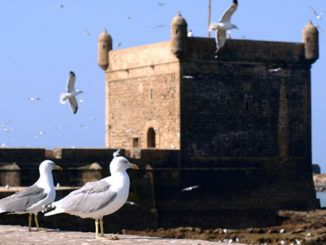 If you can avoid being bombarded by a seagull, Essaouira’s port is one of the most fascinating of the town’s attractions. At mid morning it’s a hive of activity as boat-builders hammer away at wooden skeletal hulls and fishermen unload crate after crate of fruits of the sea from an armada of small blue boats. 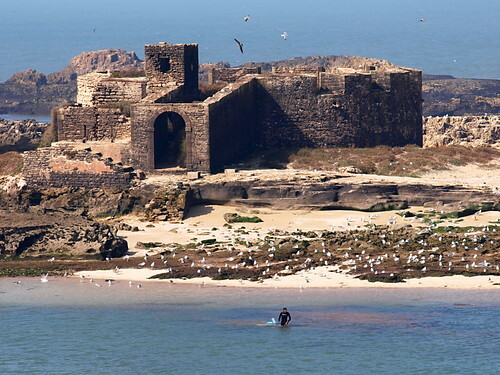 Called the ‘Purple Islands’ because Phoenicians used to extract a purple dye from molluscs here, the Iles Purpuraires are now home to an old fort, mosque, disused prison and an eclectic colony of birds including Eleanora’s falcons. Visiting is prohibited during the breeding season (April to October) but private boat trips can be arranged at other times. A permit from the port office is required. 10Dh gains you access to the fort overlooking the town, port and Iles Purpuraires. It’s a tranquil vantage point from which to enjoy superb views of all three; the view of the islands is particularly good. A plus point is that it also takes you above most of the seagulls…but not all as I found out courtesy of a wet splat on my shoulder. It’s not particularly impressive but the bust of Orson Welles, who filmed Othello in Essaouira, is worth seeking out if only for its curiosity value. It lies in the centre of a garden near the gate of Bab El Minzah beside the port. Unfortunately poor old Orson isn’t treated with the respect he deserves and is often given a colourful makeover by local ‘artists’. There’s no roughing it at Azur Art & Spa where modern art and a contemporary and ultra stylish hamman meet. Considering that this is the sort of spa where you feel like a star it’s not that expensive with basic massages from around 150DH. 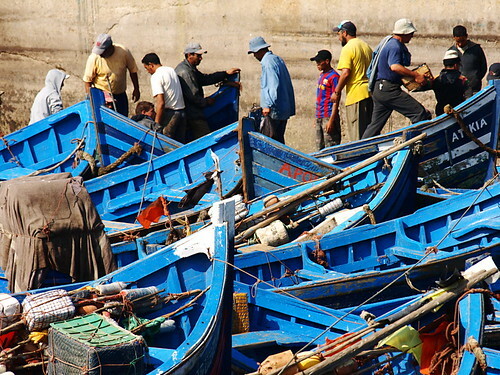 After exploring the Medina the wide, golden sands beckon and Essaouira has more than its fair share of beach. Surfers, kite-boarders and wind surfers flock to the windy waters. If you’re no good on a board you can stay on dry land and ride the endless sands on a horse, camel or quad bike. 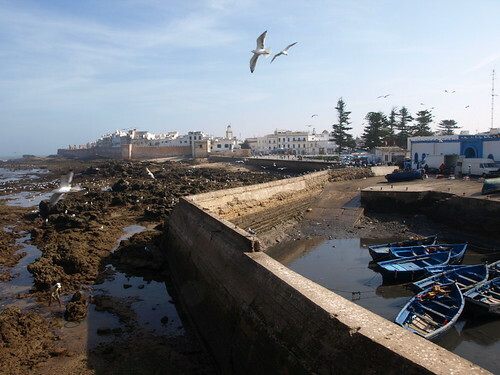 Plan, if you can, to be in Essaouira in late June (21st to 24th June 2012) for this fab festival in Place Moulay Hassan that features the best of mystical Gnaoua music as well as jazz, rock and world music. There are loads of good restaurants in the Medina in Essaouira where it feels as though there’s a wider choice of food than in the Medina in Marrakech. Our recommendations cover a range from stylish dining to budget snacking. A beautifully decorated modern restaurant with a warm, inviting colour scheme and mosaic topped tables that serves a mix of traditional Moroccan cuisine with a French influence. The starter of 10 Moroccan salads is a good way to sample an array of typical Moroccan flavours whilst the chicken pastilla (chicken in a light puff pastry pie topped by cinnamon) is an intriguing mix of savoury and sweet that works a mouth-watering treat. Painter Didier Spindler has combined art gallery with restaurant to create the wonderfully named and delicious looking Caravane Café. 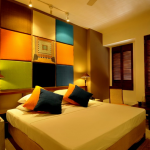 Each room is designed in an individual and, unsurprisingly, arty style. 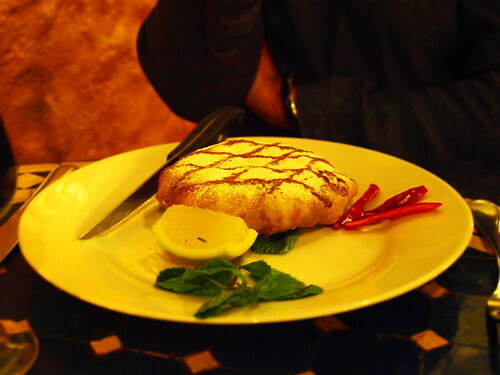 The menu is equally eclectic featuring French, Moroccan, African and Asian dishes that are as imaginative as the décor. Romantic, quirky, arty-farty call it what you like…we call it one of the best restaurants in Essaouira in which to dine. A wonderful spot, almost opposite the fish market in the Medina, to escape the dusty, busy streets. The little square is home to a handful of restaurants that are conveniently located for a spot of breakfast, lunch or coffee (as it’s Morocco, more likely mint tea) and a cake. Our pick of them was Au Bonheur Des Dames mainly because the chatty and incredibly helpful owner made it feel very welcoming. It also has free wi-fi which is a massive bonus. Place Moulay Hassan is lined with restaurants. But if you arrive in town on the last bus, finding one that is still serving isn’t always easy. There are a couple of snack bars just off the square that are still bustling after many restaurants have shut up shop for the night. They’re cheap and serve decent paninis and shawarmas (a North African sandwich of chunky meat in pitta-like bread). Essaouira is a resort town so there are quite a few places that are a mix between being a bar and a restaurant where there is also live music or some sort of show. If you fancy a belly dancing show try Casa Vera on the main square. For Gnaoua musicians head to Le Coin des Artistes (21, rue Sidi Abdesmith) and for clubbing Essaouira style it’s got to be Loubous near Bab Sbaa. 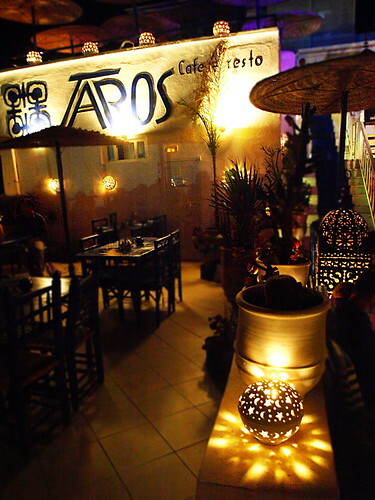 Our favourite for a sundowner, as well as being a chic after-dinner joint, is the cool rooftop scene at Taros. Being just off the main square it has great views over the fort walls towards the Iles Purpuraires. Taros also has some decent musicians which makes the 35DH bottles of local beer seem not too bad in value terms. Meaning ‘House by the Sea’, Dar Al Bahar is a beautiful, traditional dar of four storeys built into the ramparts of the old city with views over the ocean and the medina. Perfectly located within a footstep of the heart of the bustling medina but far enough away to provide complete tranquillity, Dar Al Bahar is packed to its pretty roof terrace with character and charm. Read our full review of Dar Al Bahar here.